Here’s a delicious, appetizing homemade Rava Dosa which is very easy to make...!! This is much faster to prepare than the ever popular South Indian Dosa, and the batter does not have to be fermented for long. It makes an ideal choice to serve the sudden guests too ! 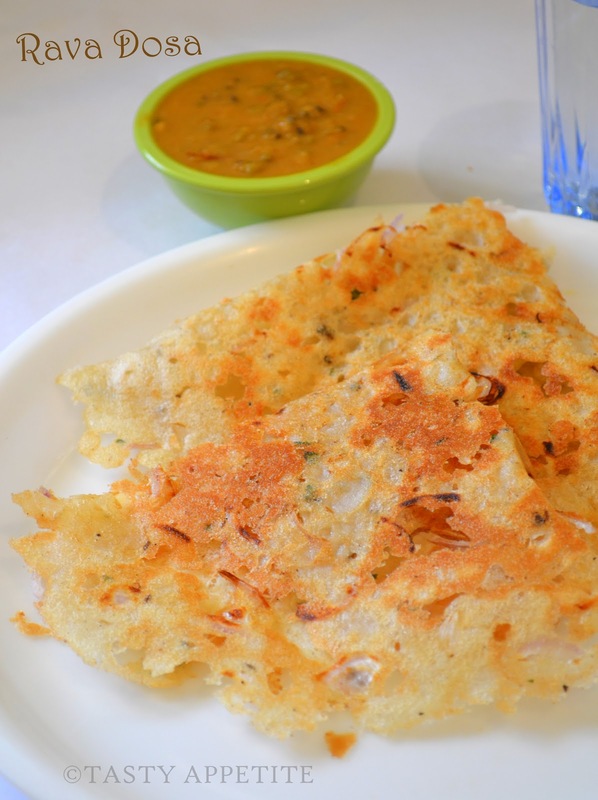 The dosas are very thin, crisp & light and is made with a batter of semolina, rice flour & all purpose flour in buttermilk. Add Rava, Rice flour & Maida flour in a wide bowl. Add salt and mix the ingredients. To this add cumin seeds, hing & coarsely grounded peppercorns. Add finely chopped coriander leaves & ginger. 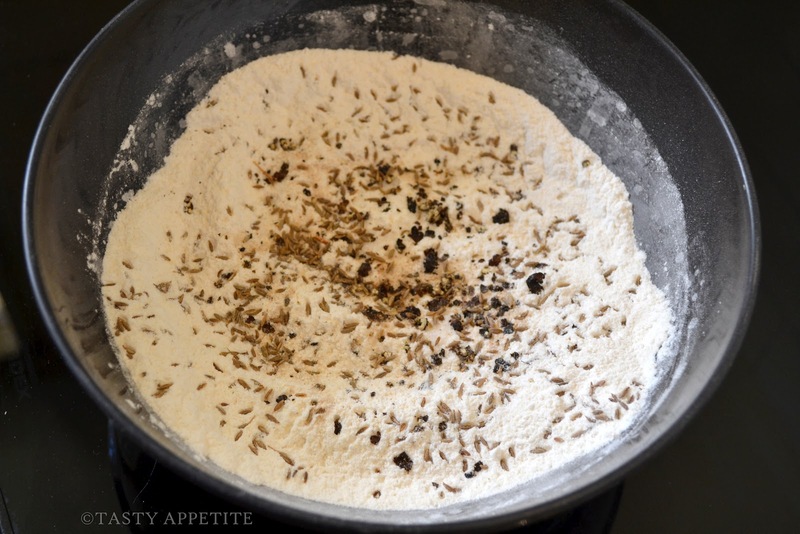 The consistency should be watery than the regular dosa batter. Allow it to stand for 30 mins. Now add little more water and stir well. Keep the flame in medium low and sprinkle finely chopped onion on it. Now sprinkle the batter ( with hands) or with a spoon on top of sprinkled onion, in round shape. 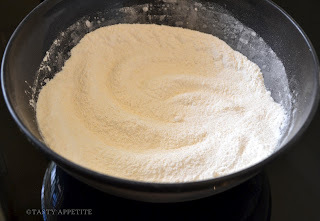 As the batter is thin, we cannot spread it like normal dosa batter. And take care not to fill all the small gaps, those gaps help in making the dosa more crispier. 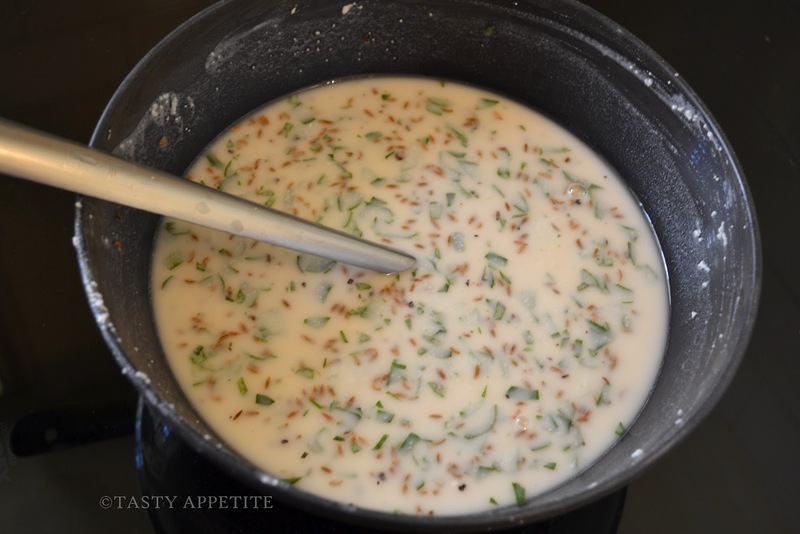 Drizzle oil ( ghee or butter ) to the sides. Cook the dosa on medium flame. 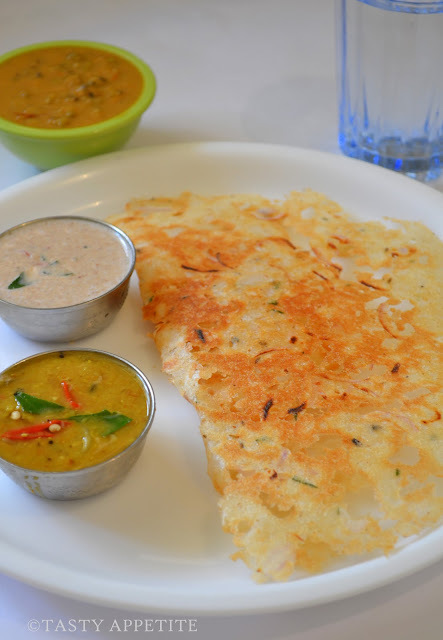 It doesn’t cook fast like normal dosa, it takes 3 to 4 minutes to get color & crispy texture. Once it is done, remove from girdle. Hot rava dosas are ready to eat. Serve with coconut chutney or any chutney , sambar of your choice. Yummy Rava dosa is ready to enjoy.! Adding onion to the hot skillet before pouring the batter, acts as non-stick agent & it will be easier to take the crispy rava dosa easily from skillet. You can also pour the batter first in the skillet and then sprinkle the chopped onion on top of it, this tastes great too..! 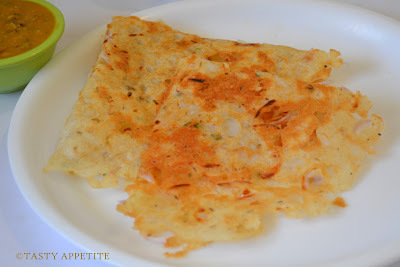 If you like to have plain Rava Dosa, skip the step of adding chopped onion to the batter. looks so comforting and delicious ! Very crisp n yummy dosa..love it,yummy platter!! Rava Dosai inviting me !!!! 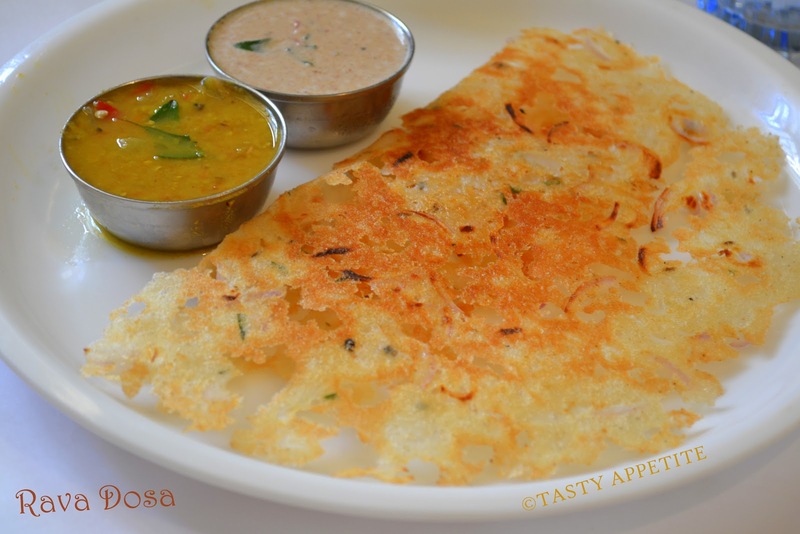 Delicious crisp dosa.. Very inviting.. Wow!..rava dosa..can't resist the temptation. I had this once and I liked it a lot! Thanks for the recipe! 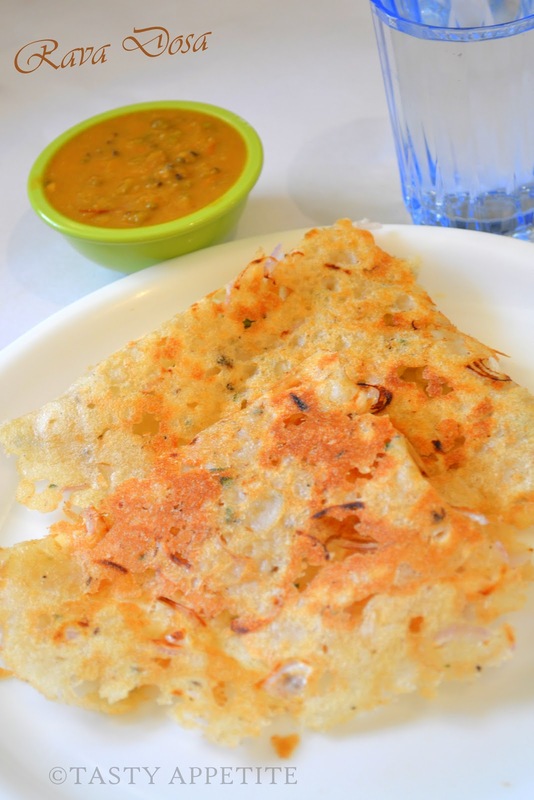 Comfort recipe for rava dosa. Its so perfect. Scrumptious. I love rava very much... If I go to restaurant, I will order "rava tosai 1... crispy please..."
will try out your recipe.. Delicious ! Ok that's for my BF today. This one for breakfast is really good. i add nicely slice carrot & green chilies as well. wow yummy. i love rava dosa more than normal dosa. whenever we eat out i prefer rava dosa and i think these ppl add kaju kishmish also here. i love it and wud love to try it ur way. That's another yummy recipe. I like to make pancake with buttermilk that give a fluffy texture. What's Hing? Lovely! 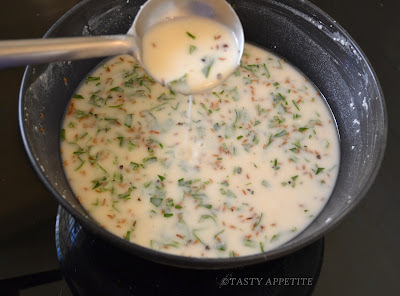 i learnt adding onions to the pan first,adding buttermilk to the batter from this recipe. 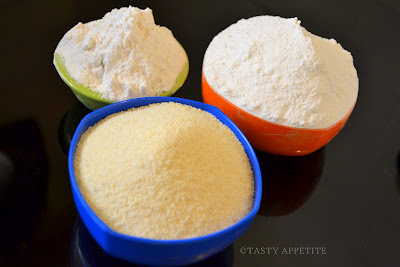 Specially like the pic showing batter consistency. Crispy outside and nice golden brown! Delicious! dosa looks yummy....i too prepare rava dosa..but this is quite different and interesting recipe..book marked and will try soon..
Looks so delicious and attractive. I'll happily have this dosa for my breakfast anytime. Jay, I love your dosas!!! And I really appreciate your translations about the ingredients, it´s difficult for me sometimes to find the exact translation at the supermarkets. Has come out so well, as in restaurants.. Always fantastic recipes ! look very tempting. 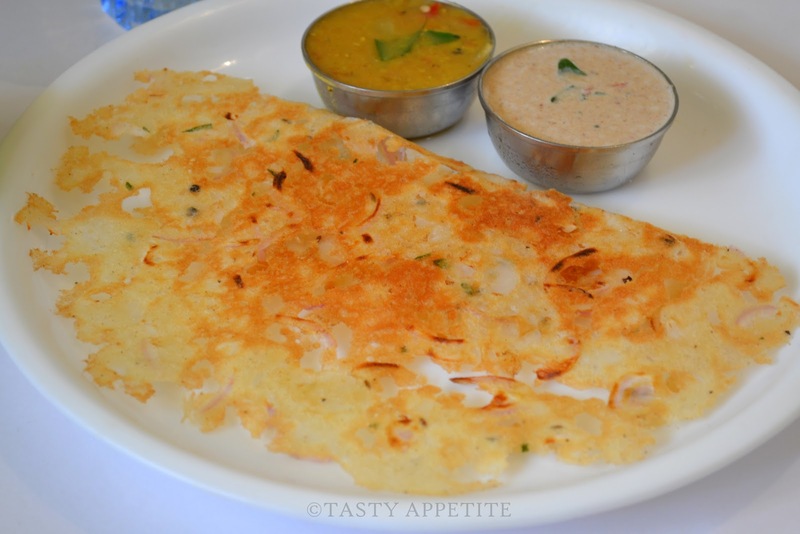 your rava dosa look very tempting. Thanks for the recipe! this looks delicious.. everything you make is yummy. Got a perfect dosa :)... My fav.. Looks crispy and delicious..
A delicious post as always!Greetings from Greece,dear Jay! superb rava dosa!!! looks crispy!!! I love dosas! These look delicious. Crispy and yum dosa,tempting breakfast. i have had half of it with chutney..yah very very crispy and tasty jay..
Have mercy...cant handle so many goodies in one day Jai ;) Yummy!